I saw this on the portal and died laughing. Really, I can...... Who am I kidding..... I was bad. I have noticed Christmas has come to the forum. 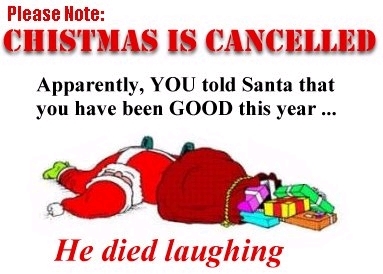 I thought Santa died laughing?? Oh! Packov, you are bad. That should be on the bad humor thread. OH MY Exclamation Shocked Shocked Santa ! The boss wondered why one of his most valued employees who had not missed a day of work ever, phoned in sick one day. Having an urgent problem with one of the main computers, he called the employee's home and was greeted with a child's whisper. " Hello ? " "yes" whispered the small voice. Surprised and wanting to talk with an adult, the boss asked, "Is your Mommy there?" " Yes ." " Yes ," whispered the child, " a policeman ". 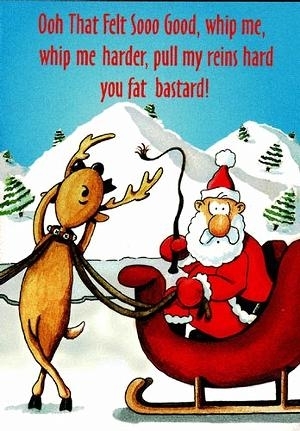 Subject: Re: I was good..... Really!